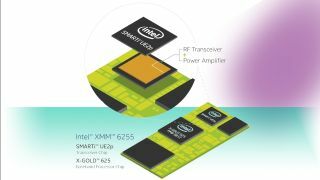 The modem combines the X-Gold 625 baseband processor, an integrated power management unit as well as Intel's Smarti UE2p, a transceiver with a 3G power amplifier. The total board area occupied by the components is about 300 mm^2, that's even smaller than the US one-cent (or one penny) coin at 362.90 mm^2 and Intel claims that it is the smallest standalone 3G modem. The XMM6255 is rated at 7.2mbps and while it is slower than the 3G+ or 4G connectivity, it is faster tha Bluetooth Low Energy (BLE) or other short range, low power technologies it competes with. Extreme integration means that Intel's partners will be able to lower their bill of material costs while improving reliability (better heat dissipation, improved ruggedness etc). Intel hasn't disclosed the power consumption of the XMM6255 or how much it will cost. Since the acquisition of Infineon's Wireless Solution Business four years ago, it unveiled a number of baseband solutions but none of them has made it into "halo" flagship devices or large volume products. That remains, until now, the quasi-exclusive domain of another US semiconductor giant, Qualcomm, with its integrated SoC and its Atheros baseband range. What is Intel's role in the internet of things?